Three female soldiers will start Ranger School again on Sunday in a third attempt to make it through the grueling two-month course. The women were given the opportunity to start Ranger School all over after twice failing to pass the first phase of the school, also known as the Darby Phase. "They earned it," said Col. David Fivecoat, commander of the Airborne and Ranger Training Brigade, which runs Ranger School. "The overall performance of the three … was very high. All three were close to making it through the Darby Phase. Let's not forget, they were given a Day One Recycle, which means they get a chance to start all over again, and that includes RAP week. That is a daunting task for anyone, male or female." The women are part of a one-time, integrated assessment of the storied school. The assessment is part of a wider effort to determine whether and how to open combat arms jobs to women, and it is a first for Ranger School, which until now has been open only to men. 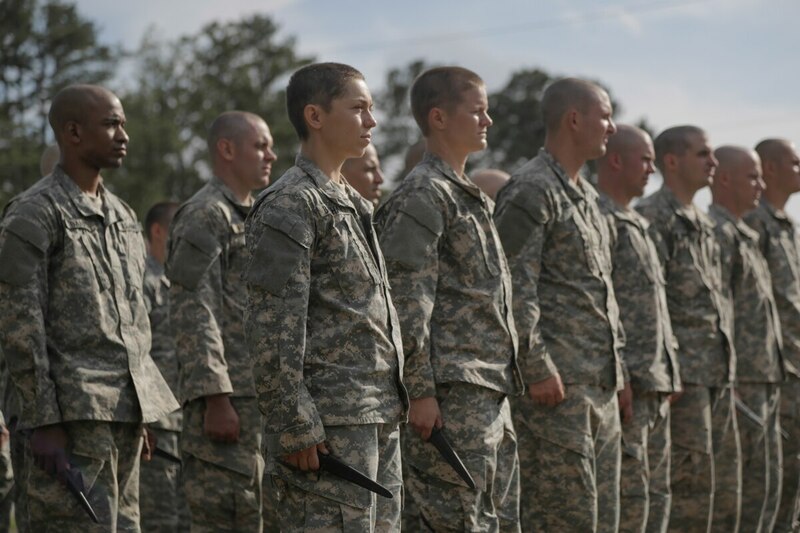 Nineteen female and 381 male soldiers started Ranger School on April 20. Eight of them made it through the famously punishing first four days of the Ranger Assessment Phase, commonly known as RAP week. On Sunday, Ranger School officials are "prepared to accept up to 400 students," Fivecoat said. The three female students, who are all officers, are scheduled to start the course alongside their male counterparts, he said. Since they were recycled about three weeks ago, the women have stayed at Fort Benning and spent their time training and preparing to retake the course, Fivecoat said. "The Ranger students, both male and female, have been participating in physical training along with other classes in preparation for the upcoming start of class 08-15," he said. "This is the same training that is executed between every class with all students who recycle here at the Benning Phase of Ranger School." A Day One Recycle means the women will have to redo RAP week, which includes events such as 49 pushups, 59 sit-ups, a five-mile run in 40 minutes or less, six chin-ups, a 12-mile foot march and a combat water survival test. The soldiers also have been focusing on patrolling, the most common reason many did not make it through the Darby Phase, Fivecoat said. "To increase the student's success with patrolling, Ranger recycle students also receive every block of instruction they received previously while in the Darby Phase," he said. "They also are given opportunities to conduct patrolling practical exercises." During the recycle period, Ranger students typically receive at least five hours of training every day, Fivecoat said. If the women don't make it through RAP week next week, "they will no longer be allowed to go further in the course," Fivecoat said. "They will have to meet the same standards that they met before," he said. Those who make it through RAP week move on to the Darby Phase, which is fifteen days of intensive squad training and operations in a field environment at Fort Benning. The phase consists of a day for basic airborne refresher and sustained airborne training, as well as a day for an airborne operation for those Ranger students who are airborne qualified (usually about 50 percent % of the class); a day for the Darby Queen, an advanced obstacle course; a day of techniques training; two days of cadre assisted patrols; three days of student led patrols; one day of retraining; three days of student led patrols; and two administrative days where the students are counseled on their performance during the phase. If the students fail an event at Camp Darby, whether it be patrols, spot reports, peer evaluations or a combination, they will be sent to the academic review board just as they were before, Fivecoat said. "If they failed for the same reason they did during the last class, they will be dropped from the course," he said. The overall Ranger School graduation rate between fiscal years 2010 and 2014 was 42 percent, according to the Airborne and Ranger Training Brigade website. About 36 percent of students fail during RAP week. On average, about 34 percent of Ranger School graduates recycle at least one phase of the school; about 61 percent of recycles are due to patrols, according to the ARTB website. The assessment allowing women to attend Ranger School initially was meant to be a one-time event. But Army Chief of Staff Gen. Ray Odierno recently said the Army is considering running additional assessments in the future. It's too soon to say when another assessment might take place. "As a professional military organization, we are always planning for contingencies, but there has been no official word on when we will run an additional pilot course," Fivecoat said. There are no plans, however, to change the standards at Ranger School, officials have repeatedly said. "We've set standards for Ranger School for a very long time," Odierno said. "I'm adamant about maintaining that. I do believe it's important we maintain the integrity of the Ranger tab." So far, the Army has learned some good lessons from this first assessment, Fivecoat said. This includes proof that women can meet the standards of the National Guard Ranger Training and Assessment Course, a two-week pre-Ranger program that all female candidates had to complete before being allowed to attend Ranger School. Women also have shown they can meet the standards of RAP week, Fivecoat said. "The cohort of women outperformed their male counterparts in the physical fitness test and land navigation test," he said. "However, some struggled during the 12-mile foot march event and moving under heavy loads." Even though no woman has made it past the Darby Phase, "it is clear that a woman possesses the ability to pass Ranger School in the future," Fivecoat said. "During this iteration, however, women failed to pass the Darby Phase due to lack of experience and the ability to command and control dismounted squad patrols."